Cropped Photo: by E. Landor, Ealing, The Book of The Cat (1903) by Frances Simpson. Image courtesy of The Harrison Weir Collection. As a breed the 'Royal Cat of Siam', or 'Wichien Maat', is one of the great "pillars" or "cornerstones" of the Cat Fancy. In this regard, it is very likely unsurpassed as it has the distinction to date of being the most widely used parent breed, and/or at the very least, a contributing breed, in the genetic make-up of so many of the latter-day felines. Every breed today which sports its genetically unique 'pointed' pattern, has been developed and hybridised by an introduction of its bloodlines. This variety, at the very least, dates back to period of the Ayudhya Empire (circa 1350AD) and its vast city of temples based at Ayutthaya. The breed is inextricably linked to the Ayutthaya precincts, and it is due to the efforts of the 'Chakri' dynasty and their predecessors, who had the responsibility and foresight to nurture and preserve this unique breed of cat, that we can enjoy the benefit of its existence today. However, the invasion of the great inland temple city eventually necessitated the relocation of the royal court to the southern city of Bangkok. Historians appear to divide themselves into two camps with regard to whether the breed was the exclusive province of the royal family and whether the Kings of Siam were personally involved in their breeding, or whether this is a myth and the majority of writers sit in one camp or the other, some claiming the link to royalty as mere myth. Taking a very pragmatic view, the truth is most likely to sit somewhere in the middle, with clear royal patronage, but highly unlikely to have had much in the way of personal involvement. The 'Royal Cat of Siam' is one of the great "pillars" or "cornerstones" of the Cat Fancy. 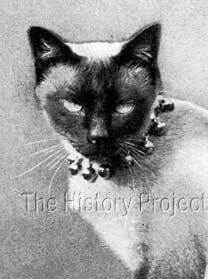 It is clear that in the high culture of Siam, cats were linked to the transmigration of souls, were known to be buried with their royal owners and were cared for and bred both within the palace and temple compounds. The cats, in their various forms, were the responsibility of the priestly cast and were certainly reverenced and prized. There is also a distinct possibility that there were several types retained, some bred by priests or monks in the Royal household, and some by the priests in the Temple compounds. Were they used in royal ceremonies? Yes. Were they personally bred by members of the Royal family, likely not. But it is always important to view this in context; i.e. Were the Royals aware that they were unique? 'Yes'. Did they recognise western amazement in the unique distribution of their pattern? 'Yes'. Were there instances of 'Siamese' gifted by the King, or his representatives, to western ambassadors and dignitaries? Absolutely, 'Yes'. Does this mean that the King of Siam bred them? A reserved 'Yes', but not strictly speaking, in the 'personal' context. The Kings of Siam were 'absolute' monarchs, so everything in the palace compounds, belonged to the King. So if someone were to ask an official for a cat, permission would still need to come from the King's secretariat for it to be released. A similar procedure would have applied to the Royal household in England. Did Queen Victoria breed cattle and poultry? 'Yes'. Was she personally involved? 'Not necessarily'. Did they belong to her? 'Yes'. Was permission needed to move the stock? 'Yes', under the strict supervision and recommendation of a manager. So why would we expect anything different from the Royal House of Siam? And it is equally ludicrous to think that examples of the breed were not being simultaneously bred and distributed outside of the Royal district, in small numbers at least. The cats had been in existence for centuries, and for centuries had very likely been gifted to members of the extended Royal Family over succeeding generations, and so too, to the surrounding lands; into what would today be Laos and Cambodia, not to mention, the possibility that some may have been gifted to other officials and dignataries of eastern origin. 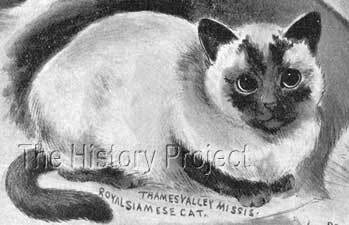 So this meant that Siamese cats were very likely to have been available from other sources, but that does not mean, that they were necessarily any less 'Siamese' than those obtained directly from the palace precincts in Bangkok, or that the Palace cats were not still a relatively 'protected enclave'. in 1875 aged 5 years. one year before the Crystal Palace Cat Show of July 1871. The first specimens of this utterly unique and much-loved breed of cat, were brought to England most likely around the 1860's. We know from the notes on this breed by Harrison Weir, that among those lucky few who first possessed them, was Lady Dorothy Nevill, whose cats were "imported and presented by Sir R. Herbert of the Colonial Office. The late Duke of Wellington imported the breed, also Mr. Scott of Rotherfield. "14 In context, Lady Dorothy was an avid importer of plants and animals, particularly birds, all of which were cultivated and displayed in the extensive grounds of her estate at 'Dangstein' in Kent. It is also known that Siamese cats were in attendance at the very first Crystal Palace Cat Show, in July of 1871, and in that case the owner/exhibitor is named as Mr. Maxwell, and were reported as "said to be the first of their kind ever brought to this country".16 We also know that Lady Dorothy, also entered some of her cats, either at this show, most likely at the subsequent show held at the Crystal Palace in December of 1871 and again in May 1872. The breed however, was still exceedingly rare in England, and it did not take serious hold of the fancy until a pair from the Palace in Siam were given in 1884 to Mr. Gould, who was Consul General in Bangkok. These were 'Pho' and 'Mia', whom he gifted to his sister, Lilian Gould (later Mrs. Veley). Their kittens, 'Duen N'gai', 'Kalahom' and Kromata' were shown at the Crystal Palace in 1885, but sadly died shortly afterwards. 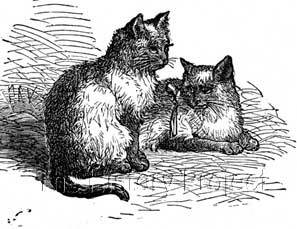 In 1886, another pair with kittens, were imported by Lady Vyvyan and her sister Miss Forestier Walker, from which eventually sprang the famous 'Tiam O'Shian' strain of Siamese. During the 1880's the Hon. Mrs. McLaren Morrison, who spent a great deal of time outside of the United Kingdom in the middle and far east, was an "importer extraordinaire" of many breeds and varieties of both cats and dogs, including, (to mention only a few) Persians and other Longhairs(via India and Afghanistan), as well as Siamese, Chinese and Japanese cats! 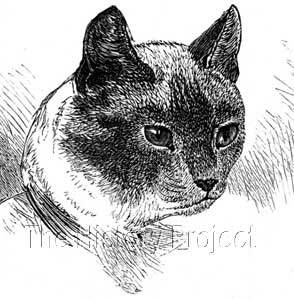 Certainly the demand for imports was considerable as evidenced by the large number of privately imported Siamese cats which are recorded in both the Registers of the National Cat Club and The Cat Club, as well as in the Siamese Cat Register, compiled by Major R. Sydney Woodwiss. In the latter document, there are over 50 cats which are either direct imports, or are the progeny of unidentified imported cats, between 1880 and 1920. So by the mid 1890's, direct importation was no longer a novelty and it was during this period that 'Wankee' made his appearance, being born in Hong Kong, and imported into the United Kingdom around March of 1896. 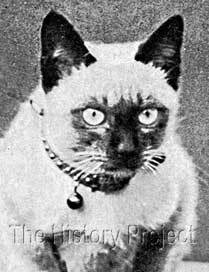 'Wankee' is one of the key progenitors of the modern Siamese breed, and from him, sprang the all the cats carrying his genes descended from 'Boojum' and 'Bandoola' through 'Prince Vudighi' and his son 'Southamption Ju-Jitsu'; and descended from 'Cairo Rameses' through, 'Ch. Kew King of Siam' and his son, ''Ch. Sancho'. "He was bred in Hong Kong, his mother -'Nims'- being a stolen palace kitten. 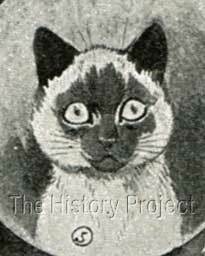 'Wankee' was six months old when he arrived in England; and was born in September, 1895. 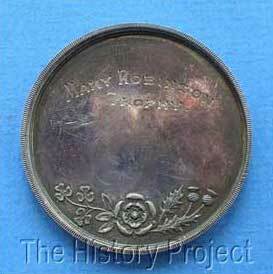 "1 (Editors note: This would put his date of arrival, as at March 1896). "The kittens are born absolutely white, and in about a week a faint pencilling comes round the ears, and gradually all the points come. At four or five months, they are lovely, as generally they retain their baby whiteness, which contrasts well with their almost black ears, deep brown markings, and blue eyes. Some kittens are much longer than others in getting dense, these making the lightest cats. "This breed is said to be kept very carefully in the palace in Bangkok, -hence the title 'royal' - and is by no means the common cat of Siam. One gentleman (a missionary), who had lived there fifteen years, had during that time, seen only three. A few years ago, there was a pair of these cats in the Zoological Gardens in Bangkok, but they were very poor specimens. No siblings of 'Ch. Wankee' are known. 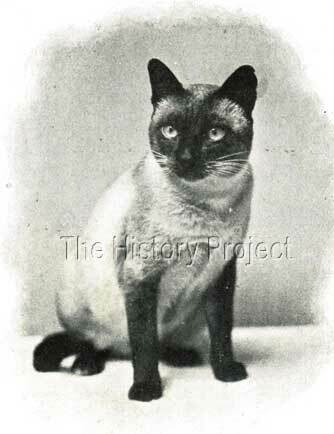 Although he did not make his first Show appearance until June of 1898, he holds the singular distinction of being the first Siamese cat in the history of the Fancy to gain the coveted title of 'Champion', setting his name firmly down for this particularly honourable achievement, but also over time, contributing immensely to the establishment and furtherance of the breed, by being a tremendously reliable and prolific stud cat, whose progeny would in some instances travel even greater distances than that travelled by their illustrious sire, reaching to almost every conceivable corner of the globe! Interestingly, although these four are all winners of Championships, only one, 'Beba' (Biba), a daughter of 'Ch. Wankee' and 'Rynda', is to be found in any register. So in this case, rather than list his progeny by males and then females, we will list as many as we can find, by 'Dam', so that we can follow what became of the progeny. 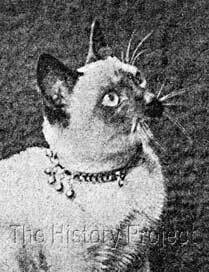 It will be noted that some of the finest Siamese queens of the era, all found their way to 'Champion Wankee'. 'THAMES VALLEY MISSUS', sold to Miss Derby Hyde. 'Missus' was shown successfully, gaining a second at the Crystal Palace and Manchester Shows of 1901, and a first at the Crystal Palace, in 1903. (No recorded progeny). 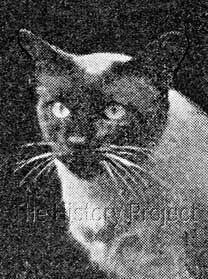 The writer is inclined to believe that this cat is not by 'Ch .Wankee', but by 'Zetland Wanzies', a son of 'King Kesho'. 'ZETLAND QUEEN', sold to Mrs. Drabble. 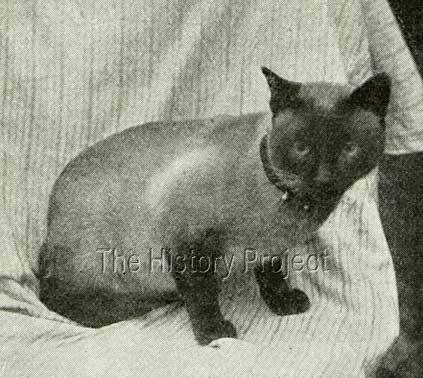 (Referred to as a Chocolate Siamese, with no recorded progeny). 'BIBA', was retained by Mrs. Robinson. Frances Simpson mentions her as gaining her Championship and refers to her as 'Beba'. 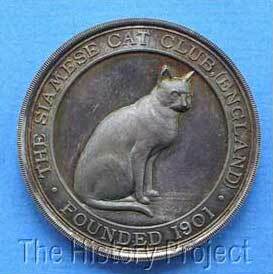 The Siamese Register records a second prize at Westminster in 1900. 'THE RANEE', also retained by Mrs. Robinson, was shown successfully, gaining a first at the Crystal Palace and Brighton Shows in 1903, as well as a second at Manchester and a third at Richmond in 1904. 'THE BEGUM', also retained by Mrs. Robinson. In all three cases, there are no recorded progeny. 'ISRAFIL', was retained by Mrs. K.O.Chapman. (No recorded progeny). 'PRINCESS NETA', was sold to Mr. R.Towler Wilkinson. (No recorded progeny). 'FULMER BOO BOO', was sold as a future stud to Lady Decies. (No recorded progeny). 'BOODOO', (no information is available as to ownership and no recorded progeny). 'WYKEE', was retained by Miss Willard. (No recorded progeny). 'AYAH', whom we find separately in the 'For Sale' columns of 'Our Cats' dated 9th July, 1904. Her date of birth is given as August, 1901, and she is advertised as having had three litters numbering 17 kittens in all. She is offered with a litter of 5 kittens, (3 males and 2 females) sired by 'King of Siam' aged 8 weeks. The owner is Miss Surman of Chesham, Bucks. 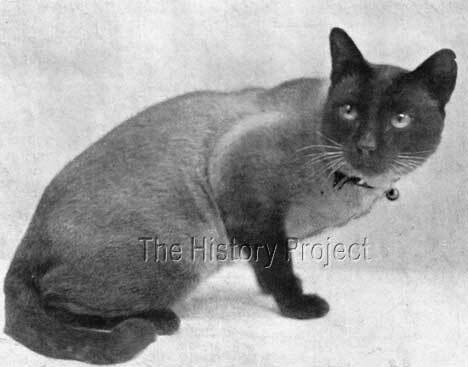 'Prince Vudighi' , and hence, 'Boojum', 'Boojum II', 'Bandoola', 'Wankee' and 'Eve' may all be found on the pedigrees of many of today's Siamese. 'Eve' at left, owned by Mrs. Backhouse, and 'Cora', at right, owned by Mrs. Armitage. In this case, the lack of any subsequent progeny appears unusual. Polyphema was a reliable brood queen, and the dam of a number of famous cats, among them 'Eve', 'Ah Choo', 'Tiam O Shian IV', 'Suzanne', and 'Vishudda'. 'CAIRO CLEOPATRA', originally retained by Mrs. Parker Brough. (No recorded progeny). 'CAIRO DARLING', was sold to Mrs. Musson. 'Darling' was successfully bred to three different males, including two of the Tiam O'Shian's, but from the resultant progeny, no secondary generation progeny have been recorded. 'CAIRO DURO', originally retained by Mrs. Parker Brough. (No recorded progeny). 'CAIRO SPHINX', originally retained by Mrs. Parker Brough. (No recorded progeny). From 'Cora', owned by Mrs. Armitage, we can find three kittens, of which only one is recorded an official register. These were 'Chaseley Mascotte', (a female), 'Chaseley Valentine', (a male), and 'Chaseley Robin' (presumed male). The first has a recorded date of birth of 14th April, 1902. 'Chaseley Mascotte' (above left) and 'Chaseley Valentine' (above right). Litter brother and sister, sired by 'Ch. Wankee' and out of 'Cora". Courtesy of The Harrison Weir Collection. 'LIDO', (a male), of whom we have the following note from 'The Book of the Cat', written by Mrs. Carew Cox, whom we suspect was his owner: "Lido, a male bred by Mrs. Chapman and sired by 'Champion Wankee', was descended from some of the best of his time; he was of the long-bodied, narrow-faced type, most graceful in his movements. "1 Unfortunately there is no further record of this lovely male, and no progeny recorded. This image shows the decided 'kink' in his tail. A photo taken early in his show career, while his coat retained reasonable contrast. sired by Champion Wankee and an imported dam. Our Cats 1903. 8 Courtesy of The Harrison Weir Collection. 'Stud advertisement for Champion Wankee'. Cats, and All About Them (1902) 7 Courtesy of The Harrison Weir Collection. Wankee became the first official Champion of his variety in the world. We can understand what a wrench the loss of 'Ch. Wankee' must have been. However, he was widely used and left progeny far in excess of the few we have listed here. In short, this modest little feline, originally imported from Hong Kong, became the first official Champion of his variety in the world. He seriously augmented the breed in the United Kingdom, and his progeny, which ventured far and wide to many shores, brought with them, the appeal and the magic of the sapphire-blue-eyed, pointed patterned, intelligent and devoted, almost dog-like feline which we today now know and respect, as the very unique 'Siamese' cat.